Plastic rubbish on a beach. Tiny pieces of plastic contaminate almost every sea in the world. Now scientists have found that marine creatures like fish and birds are eating this microscopic waste, which may be harming their health. The main concern is that microplastics are plastic pieces too small to see with the naked eye. They may be small by design, or be fragments of larger pieces of plastic waste. Their size means they can be mistaken for food by even the smallest sea creatures, as well as large animals like seabirds and fish. Scientists are concerned about the damage this could be causing. Plastics could block animals' digestive systems or lower the amount of food they can eat. Not just that, but microplastics can carry toxic chemicals on their surface. So, scientists are calling for further research into pollution from microscopic waste. "Things have progressed in terms of understanding where you can find microplastics and how much is out there, but we still haven't worked out what damage this is doing to animals," says Matthew Cole from the Plymouth Marine Laboratory and University of Exeter, who has co-authored a major review of all published microplastic studies. "We're still on the tip of the iceberg in terms of understanding how these particles affect the health of marine animals," he adds. Mass production of plastic began in the 1940s, and has since exploded. In 2009, 230 million tonnes of plastic were produced, equivalent to the weight of a double decker bus every two seconds. 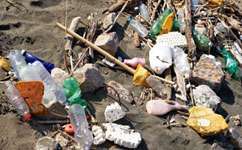 The increase in large plastic waste in the sea quickly concerned people, because of its visibility. Understandably, the spread of microscopic plastic fragments has gone largely unnoticed by the general public. But the chemicals these fragments carry may be more dangerous than the plastics themselves. Plastic often contains additives to make it last longer. These additives can be harmful to health, changing hormonal patterns in fish and birds. And, because plastics are oil-based, they are particularly good at attracting waterborne pollutants from other sources. These persistent organic pollutants can lead to hormone disruption, development problems and cancer. If marine animals swallow tiny plastic particles, the chemicals on their surface could be easily taken up. "Almost like a Trojan horse, microplastics can help transfer potentially dangerous chemicals to animals," Cole explains. The scientists also looked at where these microplastics come from. Some are designed to be microscopic. These include the beads used in exfoliating facial washes, as well as those used in air-blasters to remove rust and paint from the hulls of boats. Other microplastics may be fragments of bigger objects, from plastic bags to fishing gear. Half the world's population lives within just 50 miles from the coast, so it's easy to see how plastic waste gets into the marine environment. It finds its way into storm drains and sewage systems, where it slips through the filters in wastewater treatment works into rivers and out to sea. Around 80 per cent of plastic debris in the sea comes from inland. Now, Cole is trying to work out whether the tiniest sea creatures, called zooplankton, can take up microplastics. This is the first stage in trying to understand whether these particles can travel up the food chain. If they can get into zooplankton, then they could be passed on to bigger animals which eat them. This so-called trophic transfer could ultimately affect us too. "If they're trophically transferred they could end up in the human food supply," says Cole. "But, without doing a lot more work we won't know what the full effects of these compounds are." The study is published in Marine Pollution Bulletin. More information: Matthew Cole, et al, Microplastics as contaminants in the marine environment: A review Marine Pollution Bulletin 62(12) pp. 2588-2597, published 14th October 2011. Microbial answer to plastic pollution?